This month's challenge is a Photo Challenge! create a project using Kraft + Sparkle! You have TWO WEEKS to play along - Deadline to enter is Friday, December 4th, 2015 at Midnight CST. The winners will be announced on the NND blog on Monday, December 7th. Post your project to your blog or to an online photo gallery such as Flickr, Pinterest, or splitcoaststampers (on splitcoast please use keywords newtonsnook and IPC27). Several of our Design Team Members decided to play along - check out all the awesome birthday cards they created! Read the description below each card to see who made it. Here's a gorgeous card by our guest Designer, Tatiana! I love those gorgeous gold tags and and the gold embossed words. She used our new Jolly Tags stamp set and Tags Times Two die and the sentiment is from our new Simply Seasonal stamp set. Here's a sweet little pillow box by Larissa! I love the red sparkle she added on the snowflake tag from the Jolly Tags stamp set! She also used red sparkle on the word merry from the Holiday Wishes stamp set. Danielle created this adorable penguin Holiday card! she used our new our new Simply Seasonal stamp set for the big "happy Holidays" and added the sweet penguins from the Wild Child stamp set - so cute!! I love that gold background too! Here's a beautiful snowflake card by Jess! 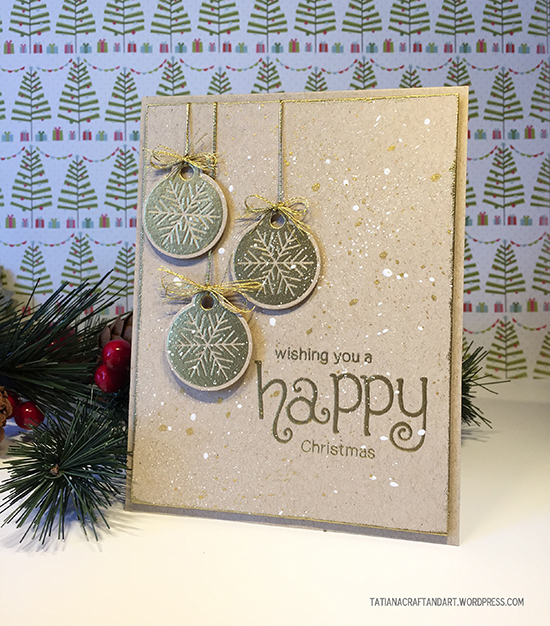 I love the embossed white on the Kraft paper - it makes the white really pop off! What a fun way to showcase our Beautiful Blizzard stamp set! I love those sparkly snowflake tags on this card by Samantha. 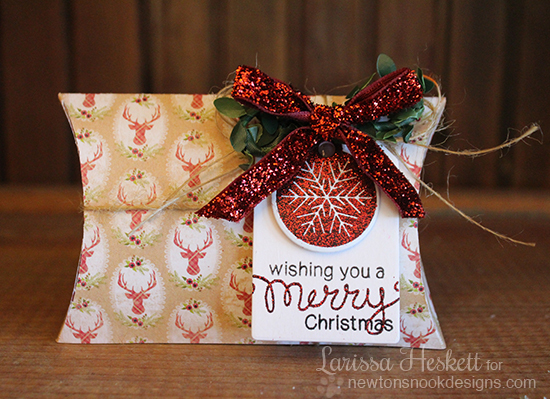 She used our new Jolly Tags stamp set and Tags Times Two die set! 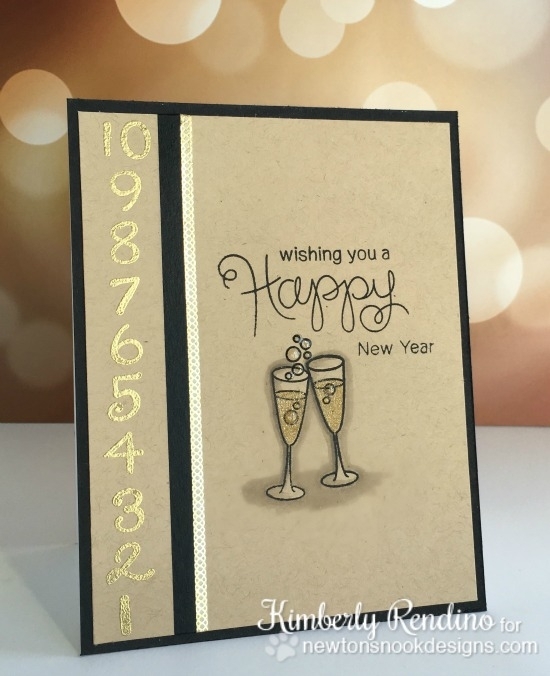 Here is an awesome Happy New Year Card by Kimberly! I love the gold countdown on the side of the card!! She used our Years of Cheers stamp set for the numbers and champagne glasses and added the sentiments from the new Simply Seasonal stamp set. 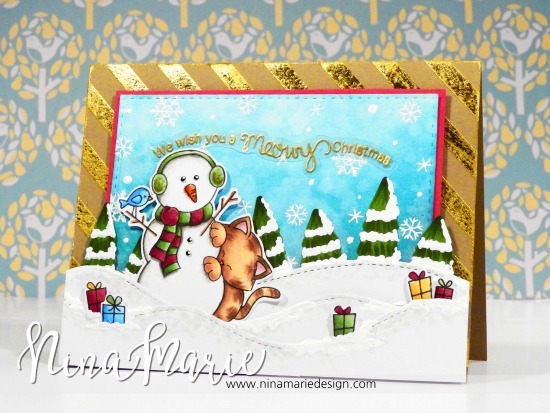 Nina-Marie created this awesome winter scene using our Newton's Curious Christmas stamp set for the main images. She also used the sentiments from the Newton's Christmas Cuddles stamp set. If you look close you can find some snowflakes from the Fox Hollow stamp set and gifts from the Holiday Wishes stamp set! I love that gold striped background too! Here's what I created! I used the Beautiful Blizzard stamp set to create gold and white snowflakes over a Kraft background and then added the "Happy Holidays" sentiment from our new Simply Seasonal Stamp set.